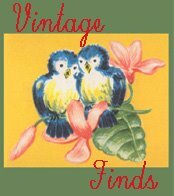 Valentines, like other vintage ephemera, often reflected attitudes of the day that would not be popular nor even deemed acceptable now. Images of blacks were sometimes drawn in a way that mimicked black face or exaggerated features to make the figures appear less human, and as vastly different from whites. Accompanying text was often also written in an exaggerated dialect. The popularity of this type of imagery in American pop culture peaked sometime around the mid to late 1930s and now has faded out of the American mainstream to a large degree although caricatures and racially stereo-typed images can certainly still be found out there today. Baby, Yo' sho' does play havoc wit mah heart! To You Ah wants to AM where YOU IS Instead of Where I BE, 'Cause When I Are Where YOU AM NOT IT AIN'T NO PLACE FOR ME! 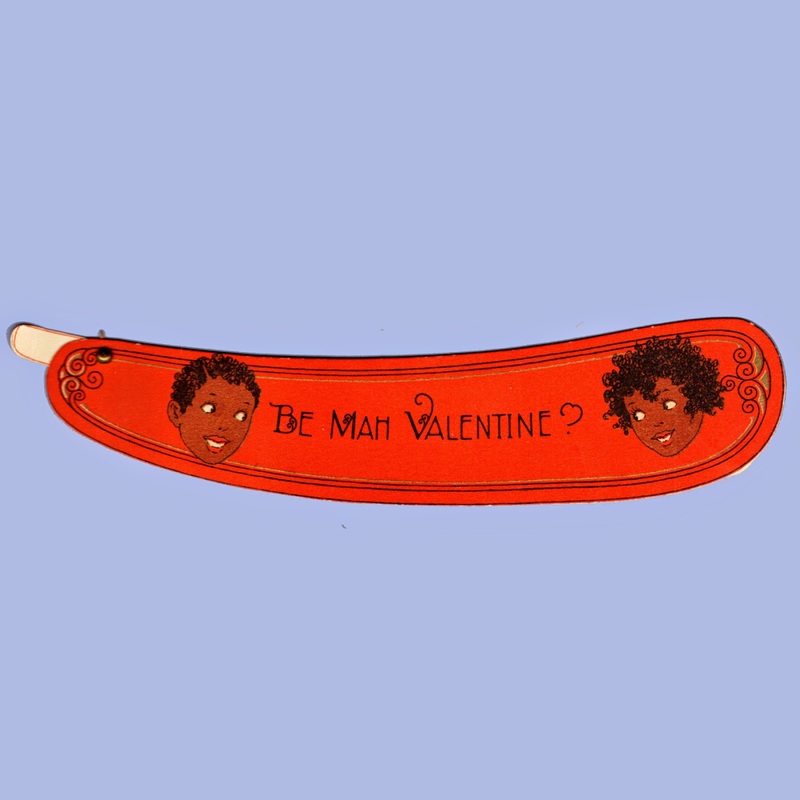 Imagery portraying African Americans on valentines runs the gamut from rather innocuous (though this seems to be a shamefully small portion of what is out there) to the I-cannot-believe-anyone-ever-thought-this-was-a-good-idea-for-a-valentine, jaw-droppingly shocking. 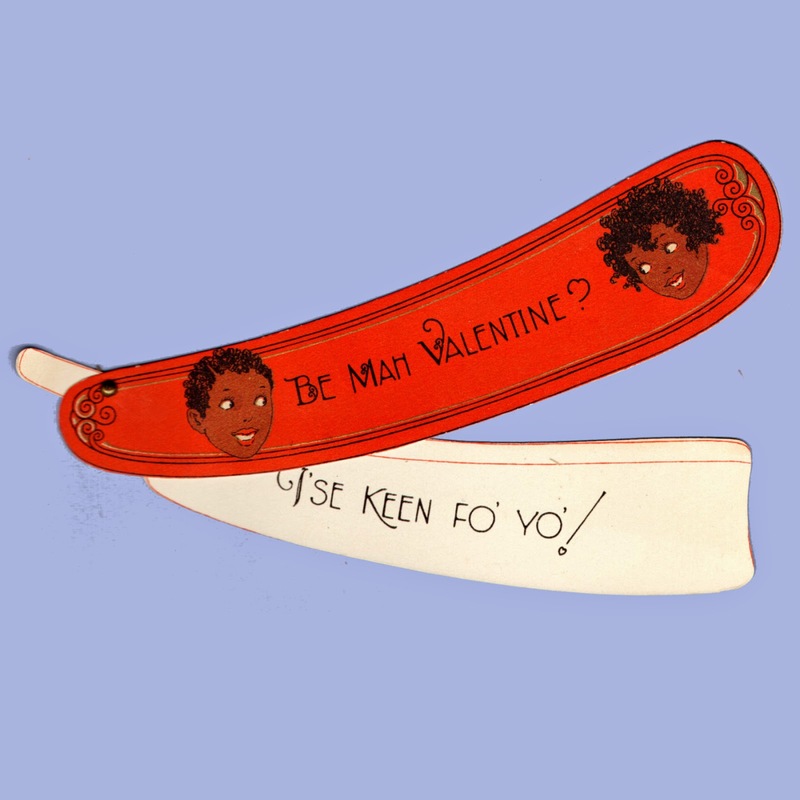 There are valentines by artists like Charles Twelvetrees, where some versions show white, chubby children and other versions are drawn much the same, but with the complexions notably darker. For such a racially charged time in the US, this was about as innocent as was to be found (which says something in itself). At the other extreme are cards like the infamous lynching valentine that showed up on Ebay a few years back. Its hard to fathom something as horrific as lynchings, something actively happening at the time the card was created, as "humorous" fodder for what is supposed to be a love token. While some of these valentines may make viewers wince, its important to remember that it was not all that long ago when images like these were mundane items. They were everyday ephemera that was perfectly acceptable to most in the dominant culture. Cartoons and advertising employed similar stereotypes as did movies, radio and television. Children's toys and literature embraced caricatured figure's like Florence Kate Upton's Golliwogg and Helen Bannerman's Little Black Sambo. Golliwog dolls were once seen as charming soft toys, often meant for young boys, and were very popular in the late 19th and early 20th centuries. They show up as characters on valentines with some regularity probably starting sometime in the 1910s running through the 1930s and 1940s. The formal attire and exaggerated lips and hair are based on minstrel show characters. Interestingly, as pointed out on the Jim Crow Museum site entry for golliwogs linked above, this makes them a caricature of a caricature. And one meant as children's fare. This sure is fine. I'll share it with you if you'll be my Valentine! This normalization of racist portrayals in the US was not limited to only small segments of the population, nor to just the American south, but was pervasive. The saturation of anti-black stereotypes in society at large helped keep the social order of the day in place and make overt, institutionalized racism like Jim Crow laws more possible. I'll be MELON-cholly If you won't Be my Valentine. Watermelon appears again and again in images of blacks from the 1920s to the 1940s (and beyond, but a bit less frequently). The fruit was used to show blacks as happily content with life as it is - no need to worry about racial equality. A comforting image for whites to reassure themselves that the racist social structure of the day was simply the natural order of things. I Love You - A Big Opening for a Valentine. 4 3/4" x 3 5/8"
Be Mah Valentine? I'se Keen fo' yo'! 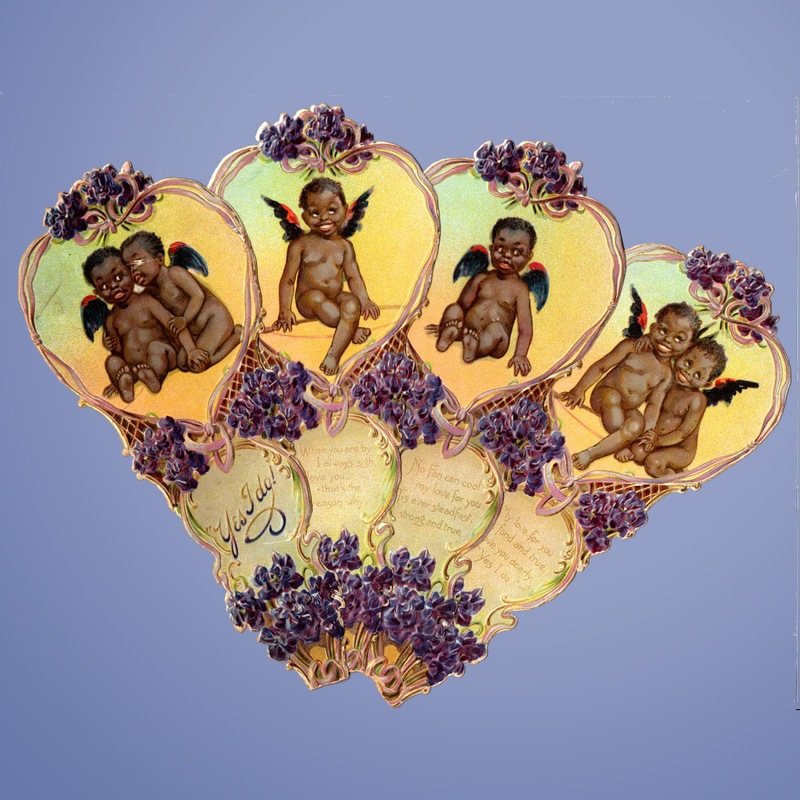 Click here to see if we have any Black Americana valentines in stock in our museum store.